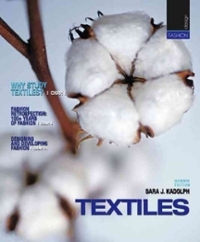 Textiles 11 Edition A revered resource, Textiles, Elevnth Edition, by Sara Kadolph, provides students with a basic knowledge of textiles, how they are produced and how appropriate performance characteristics are incorporated into materials and products. Organized according to the textile production process, the text provides a solid understanding of textile components–including fibers, yarns, fabrics, and finishes. Using new full-color photos and illustrations, it examines the interrelationships among these components and their impact on product performance. This edition features coverage of new fibers, updated industry and company examples and summary tables that make this a timeless resource for any industry professional. Also discusses the new effects of sustainablity in the industry.